Interests outside cricket: Worcester Warriors Rugby Club, Worcestershire County Cricket Club, Kidderminster Harriers F.C., getting smashed by my Dad on the golf course, getting smashed with my Dad off the golf course, horse racing at Cheltenham Festival and Happy Valley, Freemantle Dockers - oh, and learning about life through the expressive medium of dance and the poetry. Best/worst cricketing experience: Best memory - hitting Dean Headley for four in a house match (Wydle vs. Whiteladies, grudge game) whilst at school, circa 1987. Worst memory - the remainder of the over after hitting said future England opening bowler for four and having celebrated a bit early given there was four balls remaining in the over. Previous cricketing experience: Backyard tennis ball cricket hero (top score 232 vs. my brother, aged under 8), School, Club - all memorably forgettable performances. The Merv Hughes tribute XI - founder member in 1998, greatest School Old Boy team ever - my contribution on the Las Vegas 2011 tour unlikely to be bettered - travelled 6,000 miles, carried all the kit through the TSA checks at LAX, then didn't turn up for the match as was 'otherwise engaged'. Reason for joining Lamma C.C. 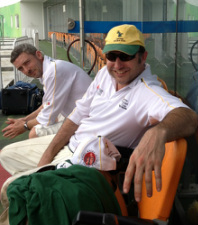 : Chucker said it was the only cricket club in HK that would let me join, Gaffer and Brad said it was great way to get fit, lose weight and give up smoking, wanting to prove to Monty that I could actually bat and have more than two shots.